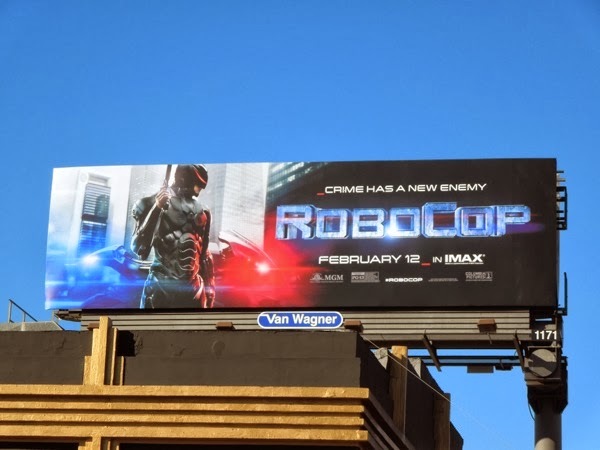 'Crime has a new enemy?' 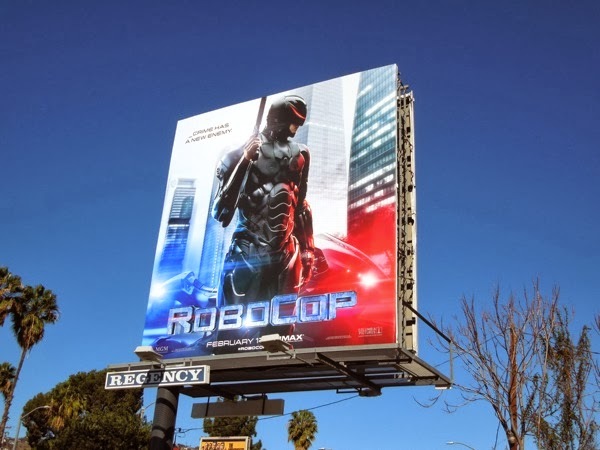 That's hardly accurate is it. 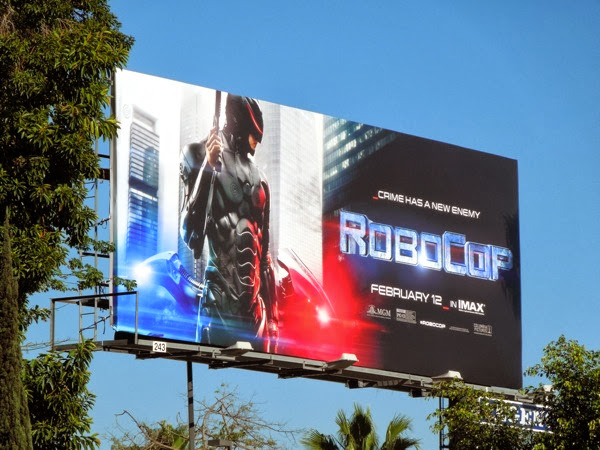 RoboCop is back on the beat with a whole new look for 2014 (or 2028 Detroit), as following several movie sequels to 1987's ultra-violent original, plus TV and cartoon spin-offs, the cyborg law enforcer is being rebooted for a whole new generation. 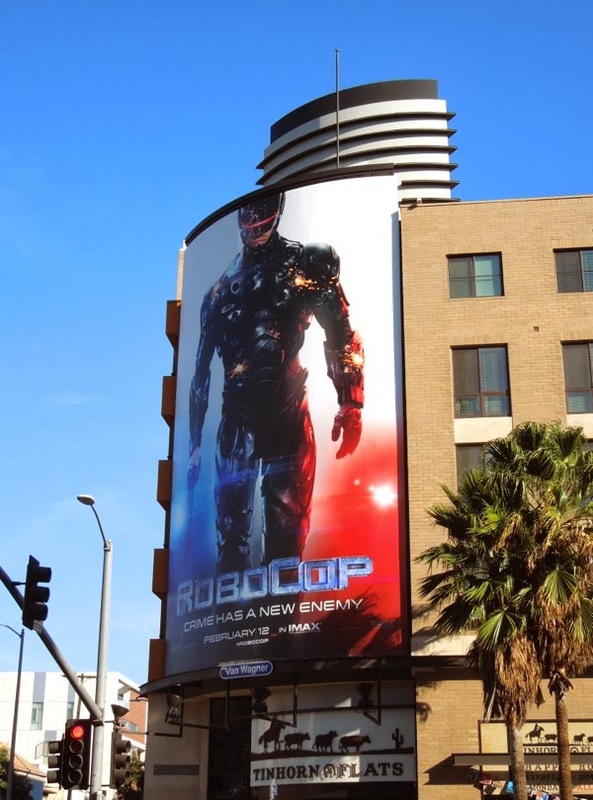 In this cinematic version, the critically wounded cop is played by Swedish actor Joel Kinnaman rather than Peter Weller, with a darker less metallic look for the future's troubled times (and a nice red visor which makes him look like a cross between the X-Men's Cyclops and Battlestar Galactica's Cylons). 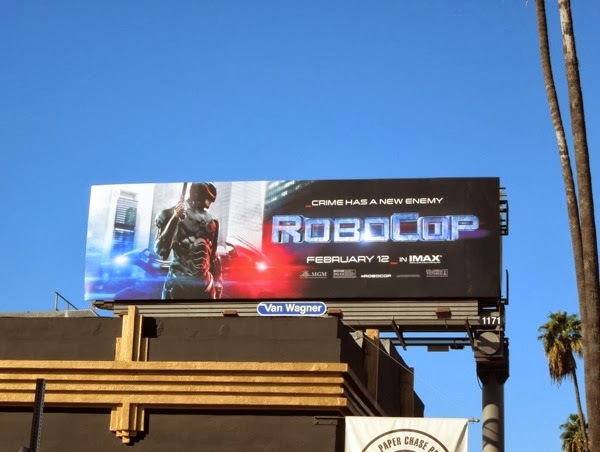 The original movie was a brilliant slice of science fiction and satirical social commentary, so it'll be interesting to see if this new reboot has the depth of its predecessor, or whether it just goes for all-out action and mindless violence. 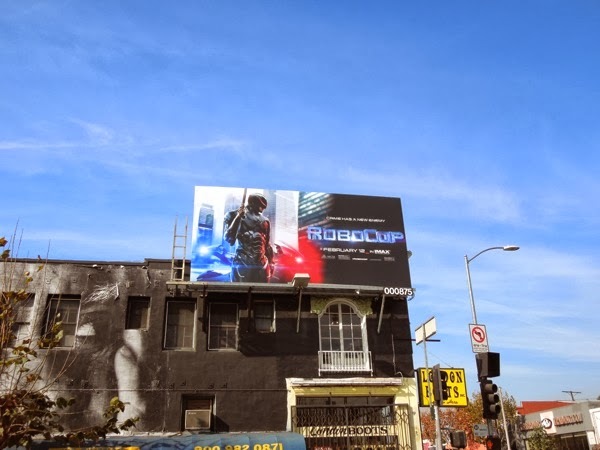 One thing's for sure, these billboards for the remake certainly scream law enforcement and sci-fi with their red and blue lights silhouetting the police cyborg. 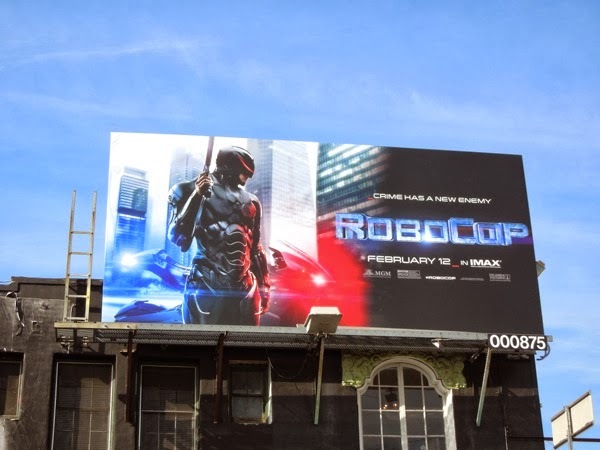 Let's see if this is one 80/90's film franchise that can achieve a successful re-imagining, as did enough people actually see the recent Jack Ryan: Shadow Recruit movie to warrant another film and let's face it, the Judge Dredd movie reboot from 2012 wasn't exactly a box office success either. 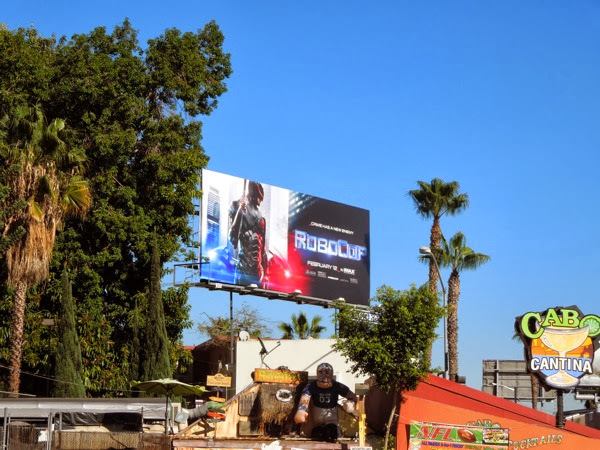 The imposing portrait ad creative was first spied along Highland Avenue on January 10, whilst the landscape versions were snapped along Sunset Boulevard in two different locations, plus along Melrose Avenue on January 16 and January 29, 2014, respectively. 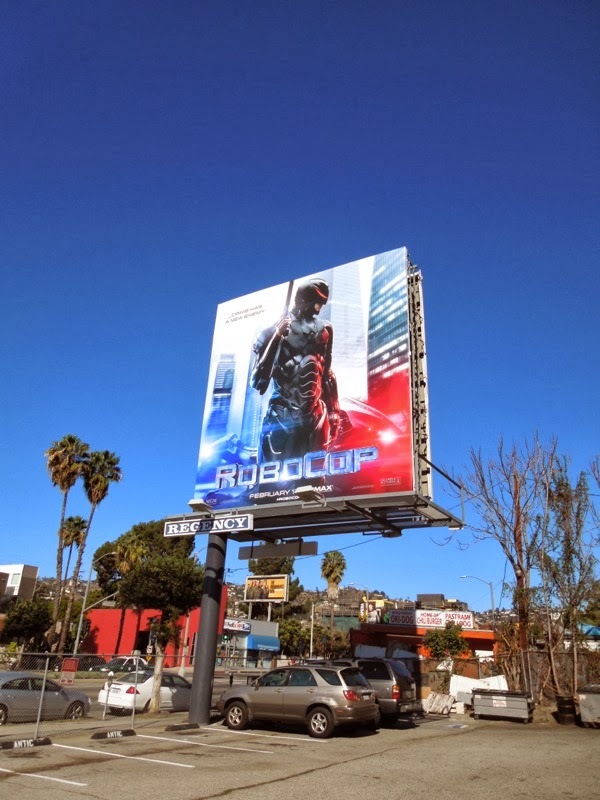 In addition the squarer billboard was spotted along Fairfax Avenue on February 1, 2014. 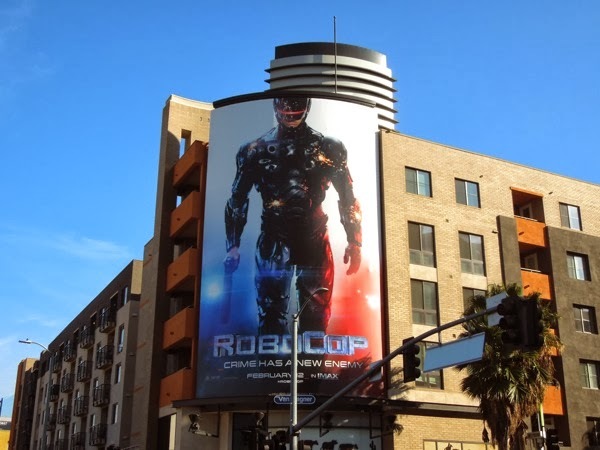 Fingers crossed this RoboCop has been rebuilt and upgraded the right way.